The following story is contributed by the Natural History Museum of Los Angeles County , one of Natural History magazine’s Museum Partners. Members of any of our partner organizations receive Natural History as a benefit of their museum membership. The Natural History Museum of Los Angeles County, which opened its doors to the public in 1913, is the largest natural and historical museum in the western United States, safeguarding more than 33 million diverse specimens and artifacts. Its main exhibition halls, located at 900 Exposition Boulevard, feature grand dioramas of African and American mammals, rare dinosaurs and fossils, marine animals, Pre-Columbian culture, gems and minerals, and historical artifacts from California and Southwest history, as well as early Hollywood memorabilia. The Museum is also an active research center, spanning living and fossil invertebrates, vertebrates, mineralogy, anthropology, and history. The Natural History Museum also includes the William S. Hart Ranch and Museum , once the home of that silent film actor, and the Page Museum at the La Brea Tar Pits . As you read this, the Natural History Museum’s Entomology Department is collecting insects in the rainforests of Costa Rica and Thailand. 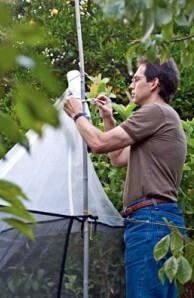 But last year, Curator Dr. Brian Brown also set up a Malaise trap in a locale slightly less exotic—his Los Angeles backyard.